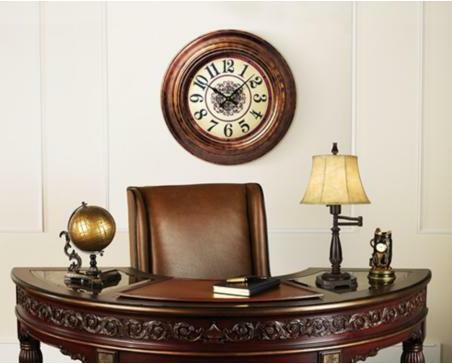 A beautiful, battery powered wall clock design with an antique-looking clock face. This wall clock makes for a delightful accent in a kitchen or seating area. It features a round clock face with black numbers. Face also has a center scroll pattern and antique detailing. Metal frame comes in a rust bronze finish. Glass covered clock face. - Hour and minute hands. - Extends 2 1/2" from the wall.